Our Books and friends dived into year six on Saturday the 28th. We produced in excess of sixty pages, and had our biggest turnout yet of both professionals and amateurs. We would like to thank our ‘artist guides’ Sao Sreymao and Moeu ‘Vuth’ Diyadaravuth for assisting the Our Books team in orienting participants and encouraging newcomers. Many elected to do the ‘Cambodian Variation’ of ‘One Hour / One Comic’ but stuck around for a little more. Due to Cambodia’s Pchum Ben holiday our event was held one week early. To encourage other participants during this global event, Our Books will be Facebooking and Twittering art and photos this coming Saturday October 05. Stay tuned for selections from 2013’s offerings on Java Cafe‘s walls, and also at Rik Reay gallery / noodle shop! For now, here are some pictures and pages to pique your interest. Blog Coverage: 24-Hour Comics Day Again! ’Strip All Night’ Exhibition Kicks off 24 Hour Comics Drawing Day! Once a year, cartoonists around the world participate in 24 Hour Comics Day! 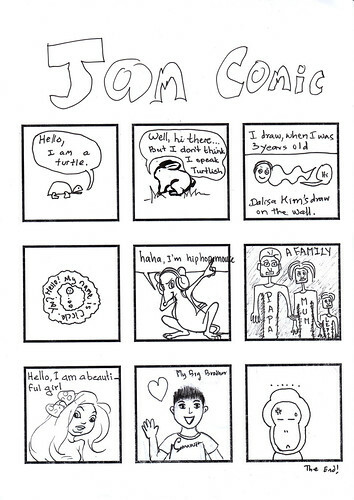 The 24 Hour Comic is a ‘free drawing’ exercise designed to unlock creativity. Our Books has been facilitating this event since October 2008 to gradually introduce Cambodian artists to this unique exercise and the global comics community. As with prior years, we offer participants a ‘Cambodian Variation’: One artist — one page — one hour of the day. Many Khmer artists have jobs, school, and family obligations, but all artists who have an hour to spare are welcome to join the fun! For 2013, Java Arts Gallery will host an exhibition spotlighting five years of 24 Hour Comics called ‘Up All Night’ (Friday September 27th). Java will host the yearly drawing day on Saturday, September 28th from 8am to 8pm. From its initial foray in 2008, Our Books has pioneered ‘The Cambodian Variation’ for busy artists. Since Khmer artists often have several jobs, school and family obligations, they were invited to select an hour of the day to complete a full 24 hours of drawings, reflecting daily life in Cambodia. A collection of these drawings (‘Our Day’) is in progress, and samples will be shown on the 27th. ’24 Hour Comics Drawing Day’ will start at 8:00 on Saturday September 28th. Coffee, art materials, food and a dedicated drawing space will be provided. For participants with children, a play room is available. Last year’s session was a modest effort and closed early due to the King-Father’s Funeral. This year, ‘Global’ 24 Hour Drawing day will fall October 05-06, during the nationwide Pchum Ben religious holiday. Comics from the event on the 28th will be exhibited immediately, and shared via social media on October 05th. Java and Our Books welcome all participants, amateurs and professionals, to join our Friday exhibition and our Saturday drawing day. Feel free to draw and catch up with other artists, be it for a brief catch-up or a marathon session. Artist guides Sao Sreymao and Moeu ‘Vuth’ Diyadaravuth will be on hand to assist with tools and materials, and Our Books staff (Nhim Soknea, Kim Phally) will be available to scan artwork for display and exhibition. From July 17 to 30th at Rik Reay gallery space: solo exhibition! Ms. Try Samphos is a young Cambodian artist who creates visual art and comic art, utilizing traditional drawing and computer design. She has trained with Room To Read, SIPAR, and numerous education-related organizations including the Buddhist Institute. Her diverse publication CV includes work with the Wildlife Conservation Society, PSI, Our Books, SIPAR and her own self-published imprint, Comics Art. She has also volunteered for the Cambodia Book Federation and assisted and participated in numerous workshops, seminars, trainings and art events. She is one of a growing number of young artists who are familiar with traditional Cambodian culture and popular Khmer culture, speaking in her own voice with enthusiasm and innovation. This very brief exhibition shows a small sampling of her wide-ranging skills. For more information on her diverse publications, you can visit her artist profile page at OurBooksCambodia.org or contact: Samphos2003@Yahoo.com. 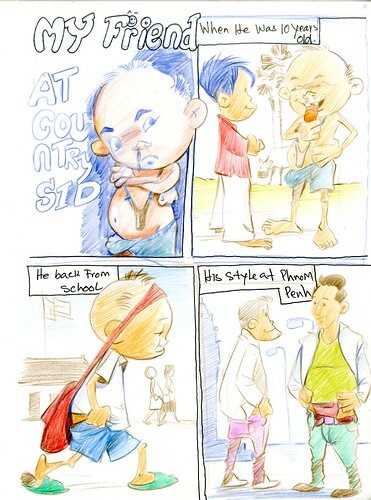 Featuring illustrations produced for Equitable Cambodia, by Sen Samondara, ‘Vuth‘, and Tek Tevin. Since 2006, Our Books has regularly worked to produce hundreds of illustrations to help explain Cambodia’s legal code. Originally produced for Bridges Across Borders‘ Paralegal Manual, the illustrations have been recycled for numerous special interest publications. ‘BAB’ recently rebranded as ‘Equitable Cambodia‘, and has a wide range of programs and publications aiming to increase understanding and participation in Cambodia’s legal system. This exhibition will run through April 30th and will rotate a variety of pictures by the featured artists. Street 178, daily from 6am to 12 noon: #69c, Street 178, Phnom Penh, Cambodia.